allow to stack records for automated uniterupted play - in other words: one would NOT have to get up to change the record until the stack is exhausted, becuase these amazing machines does the changing automatically. 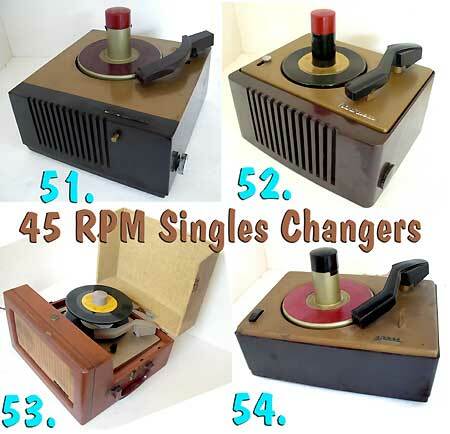 The Record Changers shown on this page are the first upgrade away form Record players. This means: like record players usually stand alone and self contained, to have a built-in amplifier and speaker. The record changers shown on this page come form a time when 78's were still in production. Thus any of these units will be perfect for 78's and 1950's mono LPs, but basically play all record types. It is said though: If having valauable mint condition collector records from a later manufacturing date, such as the 70's and 80's, a turntable or Hi-Fi record changer from these time aearas will treat your records more gentle. Some of the players shown here may have 78 only, but most offer 78 and 16 RPM in addition to 33 and 45 - thus also equipped with both sylie for 78 and LP. 16 RPM non transcription records was a format of the mid 50's to early 60's - allowing with the lower speed to double the play time compared to records of the same size. If needing 16 RPM: all of my units are labled as to what speeds they provide. Portable units, as shown here in general are self contained - nothing else needed to play recrods, but as a in world of their own, they do not provide inputs or outputs to connect to other audio devices. This basically menas: Records can be played, but not recorded. So, If you want to record form records: have your record changer custom modified, or get one where I already performed the needed work. Or get a modern custom modified USB turntable. For available speeds please pay attention to the details in my item descriptions. Most record changers shown here are tube amplified, which means nice vintage sound, but also a lot of work and hard to find parts to restore - to work properly and relaibly. Please remeber that my prices are based on the amount of work that was performed.  Refurbished - Reliably working! 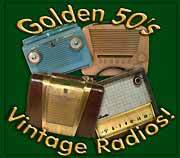 Description: In the 50's singles were BIG and this USAM made RCA unit is a stand alone tube amplified 45 Singles changer. As it plays singles only it is very easy to operate. It has a reject button to skip records not wanted, a volume and a tone control. That is it. Listen to singles with vintage tube sound! It is quite involved to restore one of these, so the price is not cheap, but completley overhauled to serve again for years! Condition: The unit shows typical signs of use and age, but is overall in good to excellent condition. Work perfomred to recondition this unit: I completely refurbished the record changer chassis, the amplifier and replaced the cartridge. This to know that the unit will be reliably working for decades to come.Work performed: Nearly a complete tear down of the changer chassis: degreased, cleaned and re-lubricated all mechanical parts, Inspected and replaced rubber parts, such as motor mounts, . Re-worked surfaces of drive parts. Amplifier: I replaced all capacitors including the electrolytic filter capacitos in the power supply. De-oxydized all controls and switches with quality contact cleaner. Other work: complete cleaning and detail work. Full functional test: OK. The unit works smoothly and sounds great. Lot: 1 RCA USA made tube amplified table top all in one 45 singles changer model: RCA 6-EY-3A as described above with original tubes installed. New stylus and stylus replacment info. Like New - Reliably working! Description: This is a fairly recently made all-in-one record changer from about 2002 with built-in amplifier and speakers. It allows to stack records for automated play. The unit is covered with tolex in a suitcase type wooden case. The unit is in excellent condition like new, ready for years of music pleasure. It extremely easy to use and the unit outputs a good amount of volume. This record changer is pefect to play 33 and 45's. 78's can be played with replacing the stylus with an apropriate 78 RPM stylus. It plays all record types automatically of any sizes. 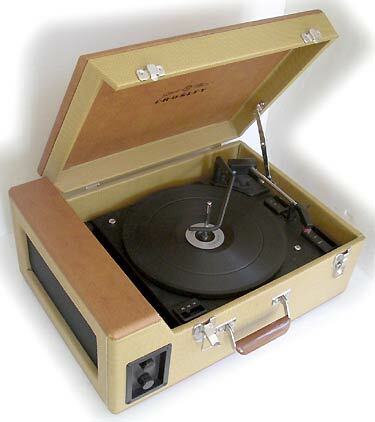 This unit has nice vintage look - Bring back memories by playing your original vintage records from decades back! Condition: The unit shows a few signs of use and age and but is in excellent like new condition otherwise(A few blemishes and scraches on the left side. Also: it looks the Tolex is slighlty raised - possibly a manufacturers defect). Over all this changer is very clean and works reliably. Lot: 1 Crosly Stack-O-Matic portable all in one record changer, includes: a good used LP stylus and 12V DC wall-wart type power supply. At additional cost this unit can be modified to meet your specific needs. See "Add-Ons and Modifications" next column. OR: Quick Check Out Shopping cart button below will bill you about $235 total ($155 + about $80= Shipping DEPOSIT) for the Crosley Stack-O-Matic changer without further modifications. Payment processed through PAYPAL. With Payment I will: pack, then calculate actual shipping cost to your ZIP code (within continental USA only! ), refund any shipping cost over payment, SHIP and e-mail tracking number. I reserve right to cancel order by refunding your entire payment. If need to approve shipping costs, before I ship, please use: Buy/Inquire instead. Please READ and agree to All details before proceding here. 1) Speaker Jacks: The unit has a stereo amplifier and 2 speakers, but sounds like mono as the speakers are monted close together. Speaker jacks will alow o hook-up external speakers and to place then separately for true stereo sound. 3) Modify for battery operation: The unit operates on 12V DC. Add battery cases so that this unit becomes truely portable. Possibly add rechargeable batteries and a charging cicuit. 3B) Car power adapter: The unit operates on 12V DC. Add a car power adapter to power the unit via the cigarette lighter jack in your car. 4) Cartridge with flip over stylus for 78 RPM: It currently has a cartridge with a fixed needle. Modify by fitting a vintage cartridge that provides a flip over stylus for LP/78. 5) Add 78 RPM stylus: a new replacement that allows to exchange the existing stlus with a 78 RPM stylus for 78's play back. 6) Add 45 singles stacker adapter to play singles stacked: I can check into if available adapters will work with this unit. Please indicate which of the above will be needed and I'll quote a price for the modification / add-on.  Custom modified to provide a 1/4 speaker output that can be used for: recording form it, a speaker, to hook it up to an external amplifier, or (mono) headphones.  The record changer mechanism was made by Voice of Music - a quality company! Description: This Admiral vintage and completley reworked US made tube amplified record changer is from the early / mid 50s. It is a stand alone 3 tube amplified record changer which means: records can be stacked for uninteruppted play and ony the unit without anything else is needed to play your records. The singles stacker adapter is included, which means can be used to play a stack of singles automatically (or a stack of LPs without the 45 adapter) - What great fun! It shall ve mentioned that this is form the days of mono when records were still thicker. It may not work well with modern records. The unit is covered with tolex in a suitcase type wooden case. The unit has been completely reworked and is ready for another life-time of music pleasure. It extremely easy to use and the unit outputs a good amount of volume. This record changer is pefect to play 16 33 45 and 78 record types automatically of any sizes. Rework included a complete re-work of the amplifier which means each and every capacitor was replaced to provide reliability for many years without trouble. This unit has nice vintage sound - Bring back memories by playing your favourites in original vintage sound from decades years back! Condition: The unit shows some signs of use and age, but is in good condition. Fully refurbished and working nicely. Please note that these early / mid 50's type of players are built prety rugged and coarse, which means do not perform to the later introduced hi-fi standards, which means the record may drag slightly, thus not the best for opera, or music that has long sustained tones, but perfect for rhythmic music. Work perfomred to recondition this unit: Amplifier: All capacitors in the power supply, and signal coupling capacitors were replaced, Deoxydized and lubricated all controls, connectors, switches. Record changer chassis: Nearly a complete tear down of the changer chassis: degreased, cleaned and re-lubricated all mechanical parts, Inspected and replaced rubber parts, such as motor mounts, some lever guides. Re-worked surfaces of drive parts, Cleaning and detail work. Full functional test: OK. The unit works smoothly and sounds great. Lot: 1 Admiral USA made tube amplified portable all in one record changer with original tubes installed, includes: The 45 singles record changer adapter, a good used stylus and a new NOS stylus in original box. Both stylie are the flip over type with needles for LP and 78. OR: Quick Check Out Shopping cart button below will bill you about $400 total ($325 + about $75= Shipping DEPOSIT) Payment processed through PAYPAL. With Payment I will: pack, then calculate actual shipping cost to your ZIP code (within continental USA only! ), refund any shipping cost over payment, SHIP and e-mail tracking number. I reserve right to cancel order by refunding your entire payment. If need to approve shipping costs, before I ship, please use: Buy/Inquire instead. Please READ and agree to All details before proceding here. 2-7 Weeks Lead Time - The goal with my work: to bring the equipment back as close as possible to original specifications and to provide reliably working condition for decades to come. This takes hours and hours and HOURS of paistaking detail orineted work. Thus prices based on the amount of time and parts needed (some are quite hard to find! - which again takes time!) to achieve this goal. Prices for the items shown below in fully restored condition typically are $300-$900. As dedicated work time to focus just on one project is in short supply, the best time with the fastest turn around woudl be to order any one of these units will be in the summer ( - May through August - ), as at other times I may NOT be able to serve you very quickly, especially during late fall, winter and the first two months of the of the new year. A note: Rushing it and vintage audio equipment, or pushing for "discount prices" do not go together! Quality work takes as much time as it takes, to do it right - and right the first time! - And: often for the type of equipment of this age it takes to get back into it, over and over again, to improve and tweak until all is perfect, so that is can ship in top condiion! If needing to rush: Please inquire for these units in "AS-Found / AS-IS" condition - I do not compromise on the quality of my cratsmanship! Thank you for your understanding. Inquire for Details and larger Images --> Please refer to item nubers and type of unit listed in picture ! EXAMPLE: " #23 Airline Tube Stereo Record Changer " . 13. Vintage Zenith Cobramatic, wooden Table Top Tube amplified hi-Fi Record changer with AM Radio (mono). 16, 33, 45, 78 RPM. 14. Motorola mid 50's Tube Amplified Record Changer (mono) 16, 33, 45, 78 RPM. 22. Westinghouse 1950's Tube Amplified Stereo Record Changer with Detacheable Speakers. Amplifer: 1 tube single eneded amplifier per chanel. Tubes: 1 50EH5 for each amplifier, 1 35W4 rectifier. 24. Westinghouse 1950's Hi-Fi Stereo Tube Amplified Stereo Record Changer with Detacheable Speakers. 25. Mercury 1950's European made Hi-Fi Stereo Tube Amplified Stereo Record Changer with Detacheable Lid Speakers. 16, 33, 45 78 RPM. 31. 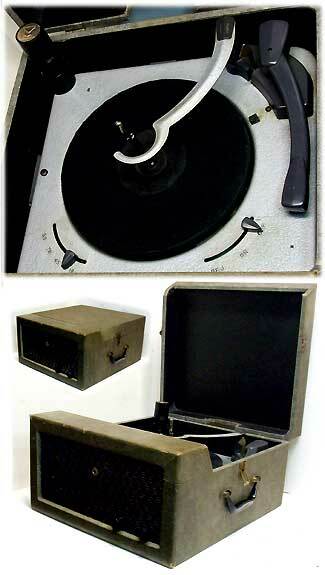 General Electric Trimline Stereo amplified portable record changer. Stereo with 2 flipable/detacheable speakers. 16, 33, 45 78 RPM. Almost refurbished - can ship soon. Original Owners manual included. 35. Late 60's early 70's Mont Gommery Wards Airline portable stereo amplified 4 speed record changer with Radio. --> Please refer to item nubers and type of unit listed in picture ! 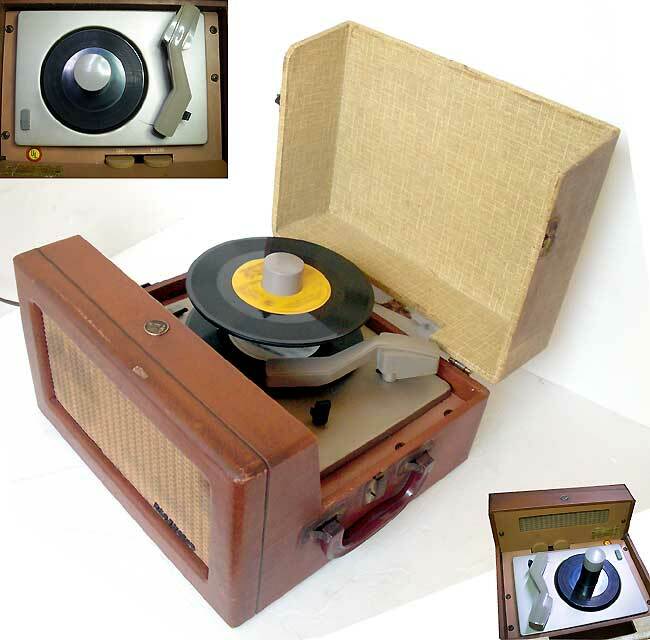 EXAMPLE: Califone Tube Transcription Record Player #42. Multi Speed Turntables for 78, 16, 33, 34 : CLICK HERE! 51. Tube amplified RCA 45 RPM Singles Changer with built-in tube amplifer and speaker. Model: 45EY-1. 52. Tube amplified RCA 45 RPM Singles Changer with built-in tibe amplifer and speaker. Model: 45EY-2. Restoration near completion can ship soon. 54. Decca model: RP-190-4a Singles Changer turntable for hook-up to external amplfier. I can modify this changer turntable and fit it with a stereo cartridge and wiring to hook to your existing stereo. Price: $275-$295 range - restored and modified. 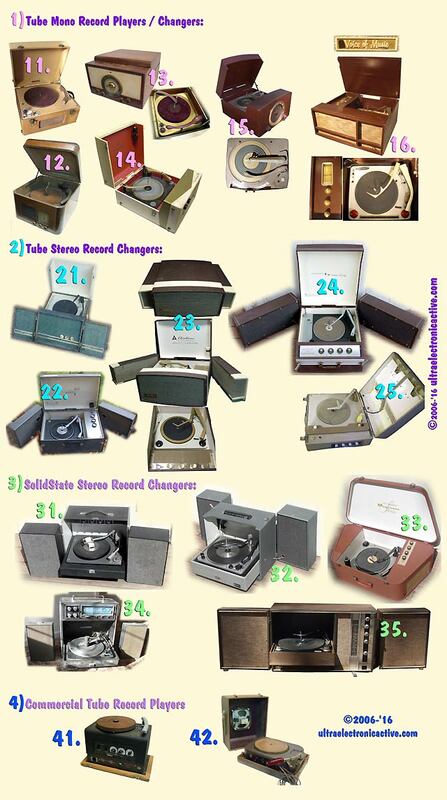 STEREO Record Changers for 78, 16, 33, 34 : CLICK HERE! Multi Speed Record Changer Turntables for 78, 16, 33, 34 : CLICK HERE! What is the difference between Record Changers, Record Players and the differnet turntable types? Record Changers allow to play multiple records automaticly without interuption. A stand alone record change rusually provides amplifer and speakers. Semi-Automatic Turntables are usually component type Hi-fi Stereo players that hook to an external amplifier or receiver. Semi-Automatic turtnables require the user to place the tone arm to play a record, but when the record has played the the turntable moves the arm back to it's rest and shuts off. A less expensive variation of semi-automatic players turns the motor off when playing is complete, and the more disirable varation of thsi sub category lifts up the tone arm and shuts the motor off. Tunrntables output at "phono" level to hook up to a "phono" input. If no phono input is present a Phono-Preamplifier is required.